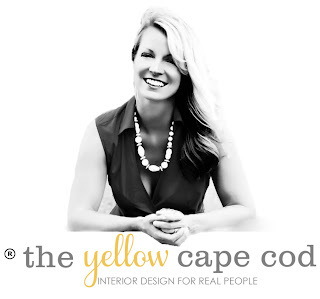 The Yellow Cape Cod: For Sale! A Gorgeous Gourmet Kitchen! For Sale! A Gorgeous Gourmet Kitchen! Update: This Kitchen Is Officially Sold! Here's the story... a few weeks ago clients of mine, Sara and Erik, asked if I would provide them with design assistance for a very exciting project, a brand new kitchen. My answer was a big yes. I love working with them and their home is absolutely gorgeous. Their existing kitchen is full of charm and character with a touch of gourmet-style. So why are they selling it and installing a new kitchen? Since Sara and Erik purchased their home five years ago, they've been busy putting their own stamp on it; upgrading and personalizing each space with custom details. They've decided their next project is the kitchen. This will be one of the biggest transformations yet and will really make this house "their's". It's bittersweet to see their current kitchen go, but their plans for the new space are beyond exciting. More details on the new kitchen to come soon. For now, I'd like to focus on their existing kitchen shown here in these images. The existing kitchen was designed by the original homeowners for their large family when this home was built in 2005. Sara and Erik took ownership in 2009 and since then this kitchen has been a great place for them to entertain family and friends on holidays and weekends. It has also functioned very well as their daily hub where they prepare meals for their two small children and manage busy schedules. 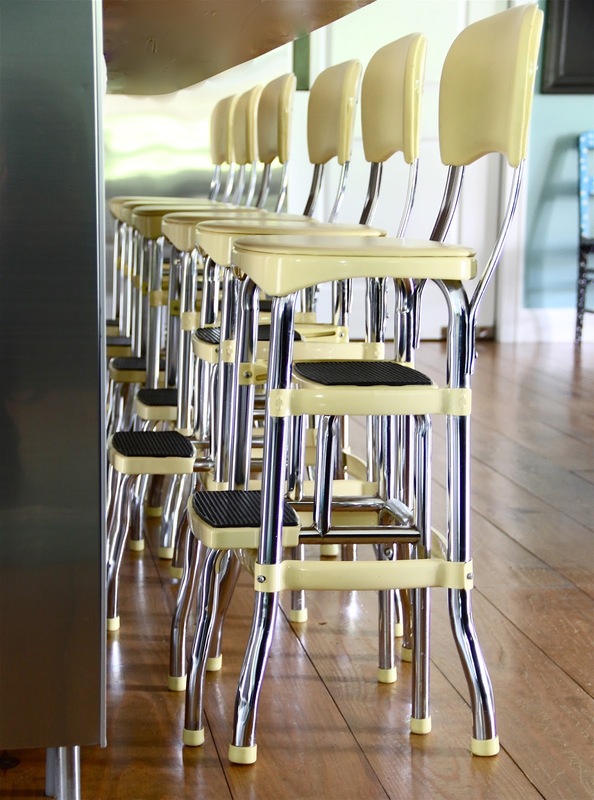 This row of six retro-style bar stools lined up at the large island are perfect for a young family. They give the space a ton of personality. Beautiful butcher block countertops lend that gourmet style to the space and warm up the stainless steel cabinetry. Open shelving provides lots of opportunity for attractive display as well as convenient storage of every day kitchen necessities. This kitchen was upgraded with gourmet inspired details like a pot-filler over the ovens. Yes….I said ovens. There are two of them! A pair of ovens placed side-by-side allow for some major cooking and baking to take place. You may also notice that the kitchen features two refrigerators, also placed side-by-side. With all that cooking going on, you know you need a lot of refrigerator space. A large, deep-apron front sink adds a little farmhouse flavor to the kitchen. In addition to lots of lower cabinet space to house culinary items, this kitchen also features a computer desk/family command center. This area (left of the refrigerators) provides lots of drawer and cabinet space for paperwork, office supplies and other items needed to operate a busy household. This kitchen is so pretty that it's hard to believe these are actually going to be "before" pictures very soon. It's not very often that I get a chance to brag about "before" photos. Thank you to Sara and Erik for allowing me to share their inspiring "before" kitchen! I'm so excited about the opportunity they are giving this kitchen to be installed in another home and enjoyed by a new family. Please contact the seller directly with any questions. Update:Congrats Sara and Erik on the sale of your kitchen and to the new owners as well!! I'm now available for new online design projects if you have a space in your home that needs a little love. Oh my goodness, that is one amazing kitchen! I can't even imagine how it could be any better. Can't wait to see the after. And someone out there is going to be so thrilled when this kitchen becomes their very own! All I can say is WOW! That kitchen is gorgeous. We built our home 7 years ago & would have taken their offer in 1 second. And the price........only $3700.00.......!!! Love it. Can't wait to see the 'afters'. This was so very lucky for us. I follow your blog and realized that we live in the same city. When I saw the kitchen I forwarded it to my husband and the rest is history. We are slowly working to renovate an 1840 farmhouse and will incorporate this gorgeous kitchen into the farm. Thank you so much for putting it on your blog for us to find.